The Airzone model 537 "Symphony Leader" was made in Australia in the late '30s and is a beautiful large bakelite 'tombstone' with a large round dial. 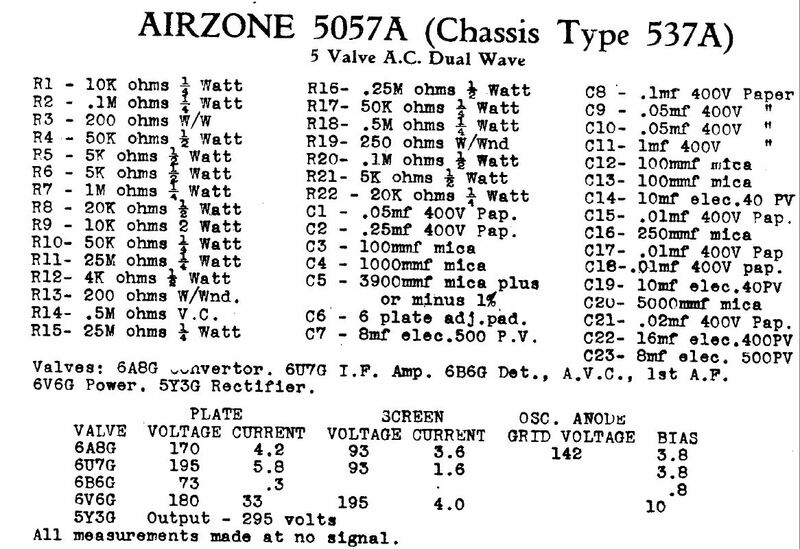 It sports an enameled Airzone badge and the lit dial turns from amber to green when switched between AM and Shortwave. A separate white plaskon fitting outlines the speaker grill. An absolutely stunning radio of perfect proportions, one of my favorites! During 3½ years of it production, only 12,000 of "Symphony Leaders" were ever made. Some were AC only, some AC/DC, others battery only. Other differences included a pushbutton version and others that were broadcast only. 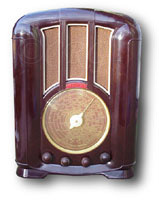 The Airzone model 529 "Radio Star" was also made in Australia in the late '30s of marbled brown bakelite with a beautiful white plaskon speaker grill. 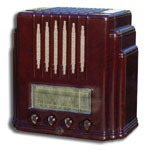 The Airzone Radio Stars were made in many versions from 1936 to 1941. 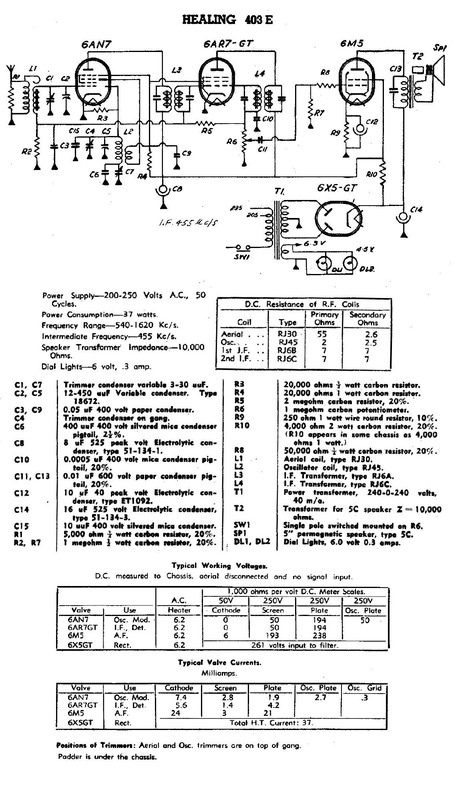 Both the "Radio Star" and "Symphony Leader" have amazing similarities to the US-made Pilot Radios, although no link between the two manufacturers has been found. A small radio, highly sought-after by collectors, especially colored versions in red, yellow and green. Click on the thumbnails below for a closer look at the dial and chassis stamp from the BP model. A brown marbled model AWA 48G and a black model AWA R29. 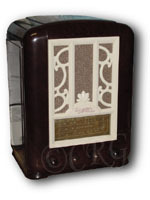 The AWA Fisk Radiolette "Skyscraper" has become the definitive icon of bakelite radios around the world. Model 38, made in Australia, brown bakelite with a chrome escutcheon and beetle grill and feet, also originally available with a green cutout grill and feet, 1937. This cabinet style was also made with a 'propeller' style dial; the model 33A. The model R52 was made in Australia in 1939 in a beautifully marbled, brown bakelite, 3 piece cabinet with a chrome escutcheon. Very similar in its skyscraper design to the model 48, but much larger. 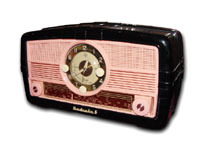 Radiola 5, clock/radio, made in Australia, unusual black and pink cabinet. A battery operated, 1940 Genalex model 775-780 with a nice enamel badge. Different radio companies used the same cabinet with different dials; Tasma, Sky Raider, Reliance and others. It is a classic design that has been recently remade with modern components. "Golden Voice" Model 403e "Moderne" , Australian, very rare green plaskon version, also was originally available in white or brown. Made in 1950. One of its selling points was to hang this heavy radio on your wall! His Masters Voice, Model 440, stunning marbling in a quality-built cabinet, using separate insert bakelite pieces for the speaker grill, dial escutcheon and trim stripes, 1938. The center white embossed emblem depicts the popular Nipper and gramaphone logo. The Kriesler "Beehive" model 11-4 was made in 1945. Interestingly constructed using separate pieces of bakelite for the top, bottom and louvers. The louvers continue around to the back completely enclosing the radio. 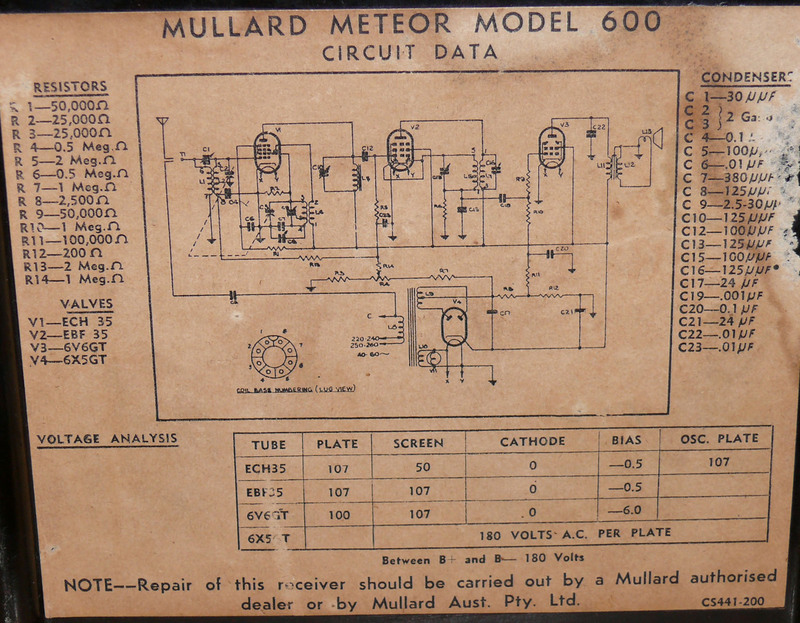 The Mullard "Meteor" model 600, with an appealing meteor trail grill. Different cabinet colors and different dials were options. 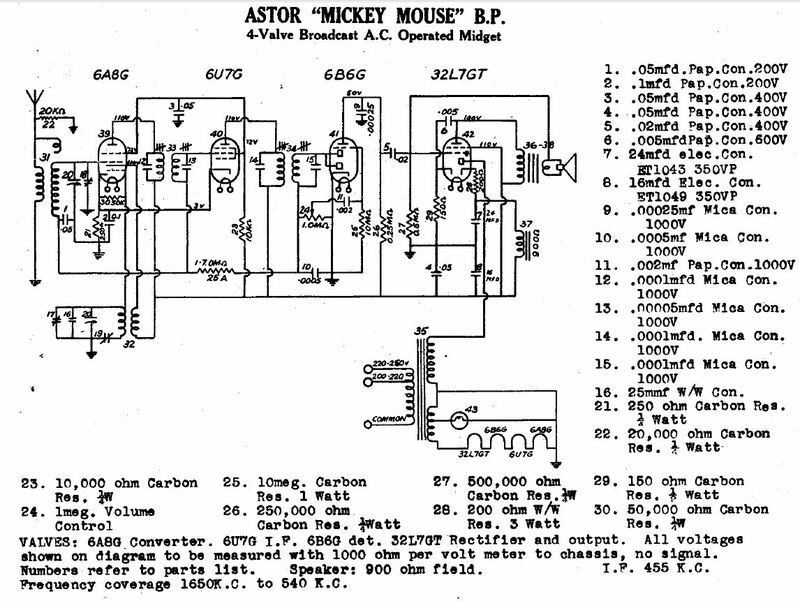 The schematic is on the bottom of the radio. "Highlight Series" model FJN, The ultimate bullet shaped radio, made in Australia in 1949. The large (17"x10"x10") cabinet is made of brown marbled bakelite with a molded bakelite back. Model GKL, made in Australia in 1947 of pink bakelite/plaskon. "The Snail", made in Australia in 1949 of white plaskon. Originally, it was available in a variety of colors. TASMA (Thom & Smith Radio Company) was a Sydney radio manufacturer that produced this beautiful 1938 bakelite set, the model 505. This was a very well-made radio, with even a separate glass covering the glass inner dial. This 500-600 series continued until the end of 1940, with some variations, including different knobs and a different design around the knobs. They included a top speaker cloth with a silk screened cabin scene. This feature and the beautiful large dial make it very popular with collectors and is quite rare. This example's dial didn't survive the journey to the US. But, I discovered the Aussie radio collectors are so friendly and helpful, and they found me an exact reproduction glass dial in short time! "Aristocrat", from Australia, the 1947 model 750 is a large (17 inches wide) bakelite set available in similar versions with different dials and 4 knobs, nearly identical to some Belmont styles. This version with a beautiful 2-color red/green reverse-painted glass dial. A white plaskon version is rarely seen. Although nearly 3 times as large, the design is amazingly similar to the US-made Belmont 519 and 520. Which came first, the Technico or Belmont? ?